Happpppy Wednesday! I created this card to send to all of our friends to let them know our new address. I'm entering this card into the Simon Says Stamp Challenge Home Sweet Home. To create this A2 card I began with a deep brown cardstock base and then cut a smaller layer in the same color, crimped this and adhered it to the card. Then I took a smaller piece of kraft paper and used an EK border punch along the side and crimped that piece as well. I rubbed a brown distress ink direct to paper and I loved how the ink just hit the top of the crimping. I know this is a kind of older technique, but I really like and and may do it again soon. 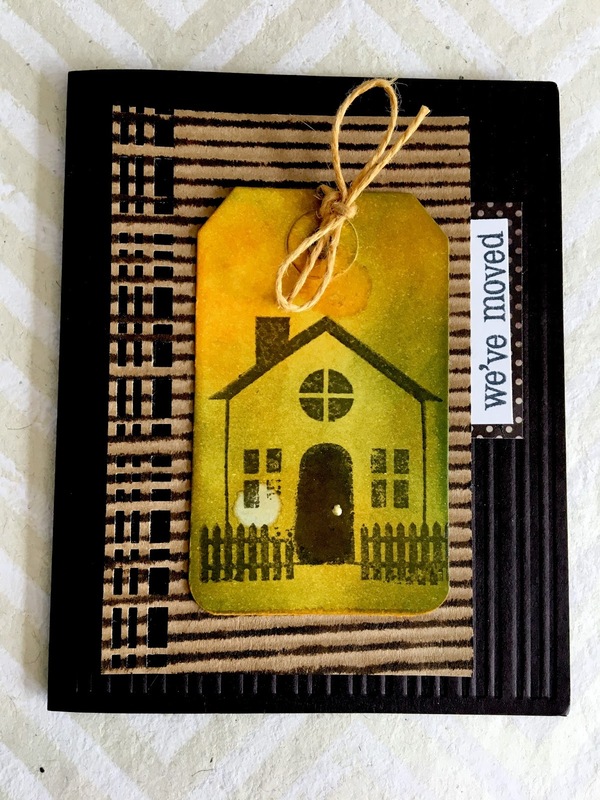 Anyhoo, after that I diecut a tag, blended some distress inks which I sprayed with water, stamped the house image in brown stazon, used some jute to tie a bow and adhered it to the Kraft layer. Lastly, I stamped the sentiment from another set onto white cardstock, and adhered this to a scrap of brown polka dot paper and slipped it under the Kraft paper. A little labor intensive, but I enjoyed doing it! Wow! This turned out so perfectly! You've got so many lovely details here. I especially love how you combined the horizontal texture with the vertical lines in the background. I never would of thought to use the colors you used, but it is a stunning color palette! You've inspired me and have created a really clever project. Thank you for sharing your talents with us for this week's Simon Says Stamp Monday Challenge! Terrific card. I really love the texture and the colour.